The three Portuguese political parties who formed an unholy alliance to vote down a parliamentary motion which would have censured Angola over the imprisonment of 17 dissidents in the ‘Luanda Book Club’ trial, have attempted to justify their action. The Christian Democrat leader of the CDS (Centro Democrático e Social-Partido Popular), Paulo Portas, has invoked what he says is official party policy requiring them “to remain silent regarding active judicial processes (…) whether in Portugal or abroad”. Similarly, a statement from the centrist PSD (Partido Social Democrata) says it was upholding “the principle of respect for judicial decisions”. 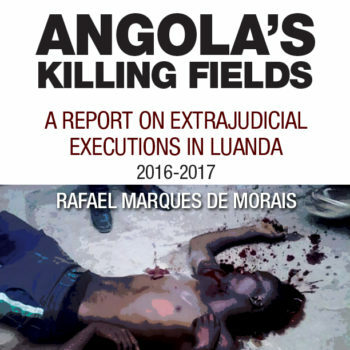 Conveniently they choose to ignore solid evidence that judicial process in Angola routinely fails to respect its own constitutional and legal dictates, acting instead in defence of the powerful. Apparently, the CDS and PSD party policy permits silence, complicity or shameless opportunism as convenient. That would be all well and good, if Angola’s courts were acting in line with juridical norms and constitutional principles. The PCP statement goes on to reveal the real reason behind their ‘defence of Angola’ in referring to “campaigns which, while nominally a legitimate civic and political intervention, procure the involvement of Angolan citizens in blocking the normal operation of Angolan institutions and in destabilising the Republic of Angola”. In other words, the Portuguese Communists are disinclined to condemn the abuse of due process because it views those affected not as defenders of democracy, nor even fellow travellers, but as anti-leftists out to subvert the MPLA – a Workers’ Party, founded on Marxist-Leninist principles. Unlikely alliances between parties of the right, centre and left in support of judicial suppression of democratic freedoms, are not without precedent, though rarely long-lasting. Perhaps the most notorious was the Nazi-Soviet pact of 1939 when two opposing ideologies signed a non-aggression pact as an act of expediency. Then the goal was the division of spoils in Poland; today it’s the division of spoils in Angola. During the long night of right-wing dictatorship in Portugal it was PCP activists at the forefront of the struggle against the regime’s secret police (the PIDE), who filled the prison camps of Peniche and Tarrafal. Back then, the PCP cast itself as the defender of freedom for the common man. Now the PCP weakly tries to justify its presence at the neoliberal masked ball, by saying that it has always remained silent on such matters, making no statement even when Luaty Beirão was on hunger strike. That is true. The PCP has always behaved like this. In fact, if we turn back the clock some forty years, the Portuguese Communists in the person of that remarkable contortionist Admiral Rosa Coutinho, jumped straight from the anticolonial struggle into the presidency of VESPER, a holding company which the Marxist-Leninists created to sell a little of everything to an Angola knocked senseless by endless conflict. Angola’s post-colonial experience is one of the most tragic in the history of African decolonisation and Portuguese communists played their part. From 1975 right up to the 1990s, the communists in VESPER sold everything that the MPLA would buy from them: wine and olive oil from the agrarian reform in the Alentejo; weapons stolen from the Portuguese colonial army; contracts with mercenaries to ensure that business deals linked to oil and diamonds would continue to run well. A cynic would say it makes perfect sense that the current generation of Portuguese communists would keep up the tradition of siding with the MPLA, which these days is less representative of communist ideals than capital with a capital C, thanks to four decades of loot accumulated with unrestrained passion. That’s how the MPLA leaders got to where they are today, controlling businesses that range from Portuguese banks to international telecommunications, with properties in Cascais and Monte Carlos, Dubai, Washington and Miami. Communist ideals masked Capitalist greed; the trappings of Democracy hid the underpinnings of Dictatorship. Lipstick on a pig. In effect, Portugal’s Communists, Social Democrats and Christian Democrats have closed ranks to tacitly approve the mugging of an entire people, linking arms with the oligarchy of Jose Eduardo dos Santos, his family and his Generals in a sinister partnership with the most heartless pillagers of a nation in contemporary history. To my mind, it’s only possible to gauge the true monstrosity of this vote against the jailed young Angolans when you take into account that incarceration in prisons like Viana involves a daily routine of savage beatings which the regime of Jose Eduardo dos Santos tolerates and encourages. It is the banality of evil, as described by Hannah Arendt in her work on Nazi Germany. When horror becomes such an everyday occurrence that people are habituated to the point of insensitivity. Just as in the hellish scenes recently reported by Rafael Marques at the Luanda morgue, where the stunned grieving relatives of the dead barely blink at scenes that would outrage the CSD, PSD and PCP leaders if their nearest and dearest were treated in such a way. True respect for human rights demands that we battle such insensitivity as a matter of urgency. Wherever and whenever possible, it is imperative we denounce the exploiters and extend a hand to the exploited. To stretch out a hand to those beaten in Viana jail, or to those who tenderly perform the last rituals of care for their loved ones, in the hell of the Luanda morgue, and give them reason to hope. More than any other country on earth, Portugal owes that much at least to the long-suffering people of Angola.